As mentioned in a previous post, in contrast to the feeble exhibits at Genesis Expo, the pamphlets on sale in the shop give the superficial impression of earnest scholarship. 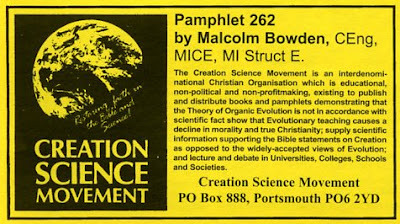 One pamphlet that drew my attention was "Decrease in the Speed of Light" by Malcolm Bowden, published by the Creation Science Movement. It begins with a graph showing the results of historical experiments to determine the velocity of light. Why is this important to creationists? Well, if light travelled faster in the past, that would account for the light from distant stars apparently taking millions of years to reach Earth – which must be false if the universe is no older than 10,000 years. The pamphlet postulates that the speed of light was actually infinite a mere six or seven thousand years ago. When I first glanced through the pamphlet, the proliferation of technical terms, and the graph on page one, gave such an impression of scholarly authority that I felt unqualified to assess it. I considered attempting to check the references and the scientific subjects mentioned, but decided instead to look at the pamphlet on its own terms and examine what I had in front of me, starting with that intimidating graph. The graph appears to plot the results of historical measurements of c (the speed of light), and the general trend supports the notion that its value was much higher in the past. The pamphlet goes on to suggest that at one point it was infinitely high. This extraordinary suggestion – derived from extrapolation of a non-linear curve – will, in Carl Sagan's famous phrase, require extraordinary evidence. So let's look at the evidence here presented. We'll start with the two measurements taken in the 18th century. The higher of the two is a quarter of a percent above the average of the highest and lowest of the post-18th century measurements – way below the accuracy I would expect from 18th century science when dealing with something this tricky to measure – by at least an order of magnitude. It's reasonable, therefore, to discount those two values. Less than a twentieth of a percent variation isn't much – I would have thought it was less than the experimental accuracy of measurements carried out in the 19th century. 20th century measurements should be more accurate, and according to the graph they all agree to within about a hundredth of a percent. A constant value for c is within the expected accuracy of all these measurements; it's unwarranted, therefore, to claim that the speed of light has decreased. The claims in the rest of the pamphlet are therefore essentially unfounded, and can be ignored until some actual, real evidence is produced. Later in the pamphlet Bowden mentions that the two 18th century values were indeed discounted in later analysis, and bemoans that this renders the rest of his data insignificant. Bowden misses the point here. He notes Aardsma's reasonable dismissal of Setterfield's observations, then – because he doesn't like the results – describes them as meaningless, when it is Setterfield's observations that are rendered meaningless. I've said it before and I'll say it again. Creationism comes down to one thing: science contradicts scripture – therefore it must be wrong. JREF YouTube account suspended - why?